When I think blueberries in baked goods, I immediately picture those ugly blueberry muffins with exploding berries and goo everywhere. Sure, they’re tasty and smell fabulous but they’re not always a pretty sight. Now, here’s a baked blueberry good that I can’t help but gawk at. These are so pretty and they’re perfect for weddings, bridal showers, baby showers, birthdays- really any occasion. I made them for breakfast. The cake isn’t overly sweet and complements the tart cream cheese very well. The cake holds up great, it is moist and has a tight crumb. 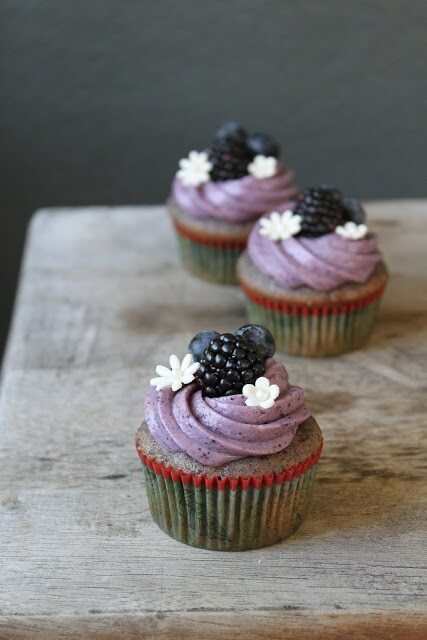 I love the natural violet color in the frosting attained from using freeze dried blueberries. You can easily swap in other freeze dried fruits (Trader Joe’s has banana, pineapple, and strawberry) to make rich colored frosting and batters without using food colorings. These cupcakes remind me of the country side and picnics and lazy summer days. 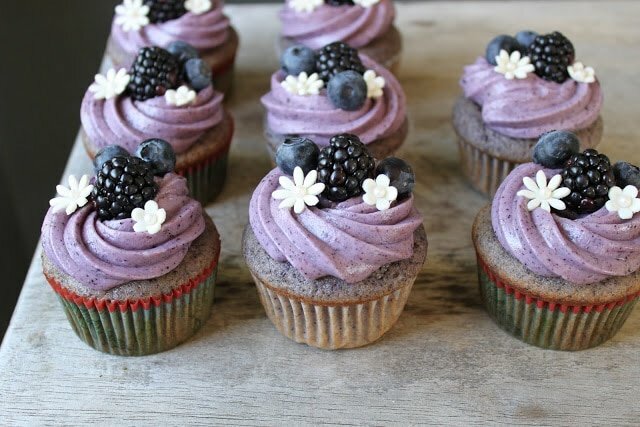 Blueberry-Blackberry Cupcakes would go well with some nice cheese, a couple slices of baguette and a bottle of wine. Oh, I miss Napa and Sonoma. In a small bowl, whisk together flour, baking powder, salt and powdered blueberries. Set aside. Cream butter, granulated sugar, and brown sugar in a stand mixer with paddle attachment. Add a couple drops of lemon oil. Add eggs one at a time and mix until fully incorporated. In a measuring cup, combine buttermilk, blueberry and blackberry puree, and vanilla paste. Alternate adding flour mixture and buttermilk mixture into creamed butter. Mix until just incorporated. Divide batter into prepared muffin tins and bake for 20-24 minutes. Cream together butter and cream cheese in stand mixer with paddle attachment. Add vanilla paste, blueberry powder, and confectioner’s sugar. Mix until smooth. Note: The mini blossoms and daisy cutouts are made from a 50/50 blend of homemade fondant and gum paste. The center is a sugar pearl. These look so stunning, your tip on the freeze dried fruit is much appreciated. This is a great way to showcase the bounty of fresh berries we have this summer. I have bookmarked this recipe. So glad you posted this-Buzz Buzz! These cupcakes are GORGEOUS! Seriously, the purple color of the frosting is just stunning! I bet they are delicious! There are some amazing ingredients in these. I’ve made something similar before, but the ground dried blueberries and lemon oil have me swooning. They’re beautiful! These look amazing. I live in Omaha Nebraska and Ground dried Blueberries and lemon oil are exactly in stock at the local grocery store. Any guidance on where to get them at? @ Tina- Thank you! You’re very welcome. @ Stephanie- Thank you! I can’t believe how vibrant the color is. I can’t wait to try other freeze dried fruits. @ Kellypea- Lemon oil gives it a nice kick. I’ve tried using lemon zest before and I can barely taste it. Thanks for commenting! @ Red2282- I was able to find freeze dried blueberries at Trader Joe’s and Target. If you don’t have those near you, I suggest amazon.com. As for the lemon oil, I bought it at Williams Sonoma. You could also substitute lemon zest. your version is so beautiful! Thanks for your beautiful take on my more homely cupcake!! These cupcakes look great!! Thanks for sharing the recipe. my word these looks absolutely PERFECT!!! Wow, i like blueberries very much. Keep it up.. Very nice cupcakes. Thanks for sharing. oh wooowww, these are purely stunning, and my goodness i bet they taste gorgeous too! Just a short to say -These are FABULOUS! Those are gorgeous!! I love the colors and the garnishes! I bet they’re delicious. Thanks for sharing! Absolutely stunning photos,And now i must to make those amazing looking cupcakes, or I will never have a good night sleep again! I will be on the hunt for freeze dried blueberries, stopping by at TJ’s and Target this weekend :)Thank you for a delicious inspiration ! These are so gorgeous! For the frosting, I was just wondering what cream cream was and where you can get it and also where to get vanilla paste. Thanks! @Esther- Thanks! You can get cream cheese at any supermarket. Its in the dairy section near the yogurt and sour cream. Be sure to get the regular cream cheese because the low fat and reduced fat cream cheese don’t work as well in frostings. You can find vanilla paste at speciality stores like Williams-Sonoma and Sur la Table, or you can substitute vanilla extract. These look absolutely gorgeous! 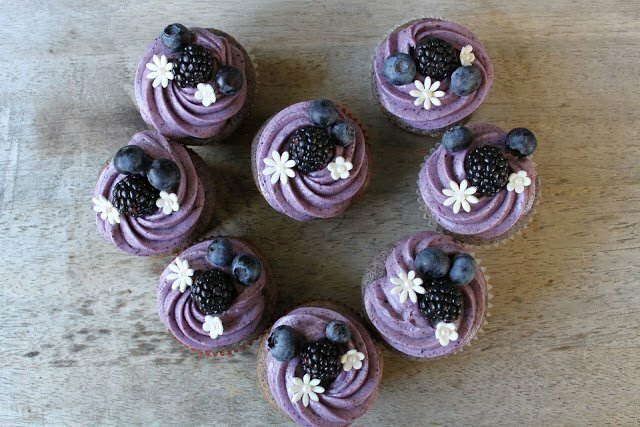 Great idea to flavour the cream cheese frosting with freeze dried blue berry. Thanks, Charity! I fixed it. The recipe is supposed to say cream cheese. :) home grown blackberries?! That sounds amazing. I wish I had a green thumb! Goodness, this is the perfect cupcake, hands down! I can never get my cream cheese frosting to pipe so well. Your swilrs look lovely. Try whipping the cream cheese frosting until its quite smooth and fluffy. Also, make sure your cream cheese and butter are at room temperature before creaming them together. WOW those look super yummy and you made me want some lol! I may have to try these one day! These look so beautiful! I really need to learn how to make my cupcake looks this pretty. Will it have the same beautiful color if you use fresh fruit? Thanks, Susan! Unfortunately, you won’t get the same vibrant color with fresh fruit. Also, the moisture from fresh blueberries will affect the texture and consistency of the cream cheese frosting. Are freeze dried blueberries easy to find? I found freeze dried fruits at Trader Joe’s, Whole Foods Markets, and surprisingly at Target. Thanks for posting this. I am getting married next May and want a cupcake wedding cake; however, the one I wanted was so elaborate and quite costly. I thought I would make my own but didn’t know what sort of decorations to do. It’s a wedding in the country and I think these would be beautiful, especially since my colors are blush pink and wisteria!! This is just a wonderful colour combo, I love the mini blossoms with the dark, rich blackberries!!! Just made these and they were described by my father as “Better than steak!”, which never happens.Definite 10/10. I had to work hard though; I don’t own a balance so I had to sort of guess around the berry measurements. If anyone else finds themselves in this predicament, I have some advice:freeze dried blueberries were NOT easy to find at my local Target (had to fish the blueberries out of a mixed berries bag), definitely buy them from WF or TJs to save time. 17 grams of dried blueberries is about a 1/3 dry cup. 7.5 g of flour is a dry cup minus 2 Tbsp. 3oz buttermilk is just over the 1/3 cup line, and if you fail at straining the blue/black berry puree as I did, throwing a big hand full of each into a blender and just dealing with the seeds doesn’t affect the texture too much. Out of curiosity though, how does one strain the thick mucus that is berry puree? I’m sorry to hear you had a difficult time finding the freeze dried berries. Did you use fresh blue/blackberries for the puree? I just a regular fine mesh strainer for the puree and it worked fine. You could also use cheesecloth and squeeze out the puree. I used fresh berries, but the puree was too thick to fit through my strainer. They were still the best cupcakes of my life, with the seeds and all. Thankyou! I love these cupcakes! They are to cute!!! I made them for my birthday ball. Although I used a lemon cake mix for the cake, I didn’t have time, or room in the kitchen to make cupcakes from scratch. But I used the frosting recipe, and decorated them similar. 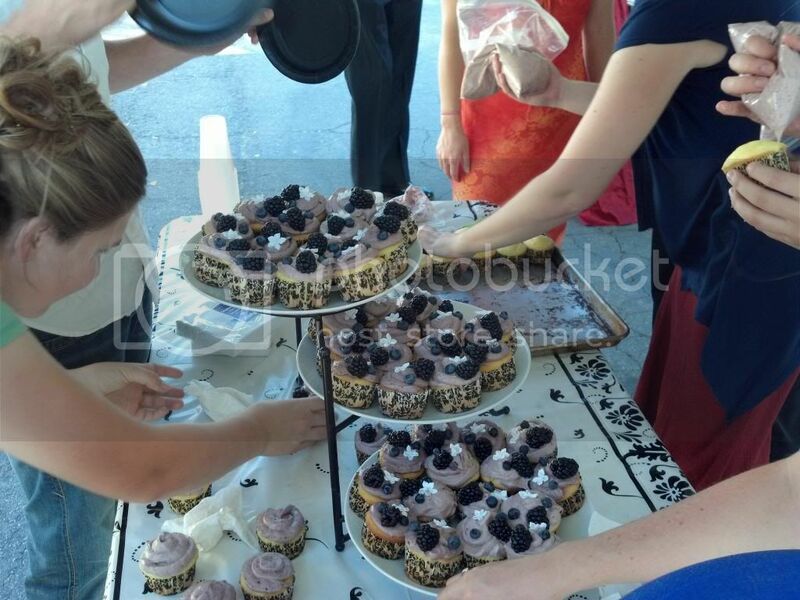 I could not find the freeze dried blue berries at a reasonable price (I had a tight budget and 75 cupcakes were adding up) so I used just dried blueberries, and pureed them until they were smooth. It worked great! I didn’t get the greatest pictures, but here is one of me and my friends putting the icing on at the last minute, in 90 degree weather, it was melting a little, but considering the heat, they held up well. Happy belated birthday! Glad you tried out the recipe. Freeze dried fruits can be quite pricey but a little does go along way. I L-O-V-E this post… Could you tell me where you bought the two flower cutters…? Thanks so much! where do you find freeze dried blueberry? what is that? I bought mine at Trader’s Joes. They are also sold at Whole Foods Markets and sometimes I can find them at Target. Freeze dried blueberries are completely dried and free of any moisture. Its not like regular dried fruit that is soft and full of water. When freeze dried blueberries are crushed, they turn into a powder that is a wonderful color enhancer. Just made a double recipe of these and decorated with the berries and royal icing flowers. Had to substitute vanilla extract for paste and lemon zest for oil, but they are delicious!! I don’t usually eat desserts that don’t involve chocolate, but these are amazing! Freeze-dried fruit is new to me — can’t wait to try it with others recipes. Thank for posting this recipe! These are gorgeous! I have piping envy. Both the cupcakes and frosting sound incredible. Pinning this to make later! These look wonderful and i would love to make them. A question the recipe says “7 1/2 oz all purpose flour” is that 7 and 1/2 cup of all purpose flour or 7i/2 ounces– meaning just under a cup?? Hi Rachele, the 7.5 ounces is the weight of the flour. I used a scale to measure all the ingredients for this recipe. If you don’t have a kitchen scale, there are plenty of websites that will tell you the conversion weight of flour to cups. Hope that helps! Hi, I made these last week and they were THE BOMB!! Best cupcakes I have ever had :) I have one question though..I want to make strawberry cupcakes. Can I use the same recipe just substituting the blue/blackberries with strawberries or any other freeze dried fruit and I assume minus the lemon oil? And yes, you can use the same recipe and substitute the strawberries. Where can I find the pretty white flowers you used to decorate? And the center of the flowers are sugar pearls. I have the freeze dried blueberry powder pre packaged about how much of the actual powder would I use? I do a lot of baking but never with freeze dried fruit and I’m making these for a wedding. Can you use dried blueberries in stead of freeze dried? Hi Haley! Unfortunately you cannot substitute dried blueberries for freeze dried blueberries. Freeze dried blueberries are 99% moisture free, whereas dried blueberries still have a ton of moisture. The results will not be the same. i live in Hawaii and there is no Trader Joes or Whole Foods at least on my island , so don’t know if I will be able to find some of the ingredients. It’s harder to find things here like blackberries, can you use frozen? What is vanilla paste and could I substitute it? What is lemon oil and can I substitute it? I hesitate t o purchase something especially if it’s expensive and I would not be using it again. If it’s something I can buy in the bulk section no problem. Don’t know if they carry freeze dried blueberries here, will have to check. Is the freeze dried blueberries just for the color aspect of it? If so I wouldn’t need to use it, thought I would like the frosting to be purple as its my favorite color and the color is part of the appeal for these. Anyway can convert the measurements for me ? I’m not good at math, besides have limited access to Internet, none at home, have to go to library. Tried these today- I had all the ingredients- they turned out beautifully. I never would have thought to take the freeze dried berries and process them. In the frosting I added the berries to the butter and it incorporated well- got the beautiful color and taste. Thank you! I’m not a huge baker or anything so i need some help, how do you puree the blueberries and blackberries? You can place the fresh blueberries and blackberries in a food processor or blender to puree them. I like to make them eggless. could you please recommend the substitute for egg and not compromising the taste and texture? But using ground flax w water make a great egg substitute. I’ve used for other baked goods like muffins, but not this recipe. 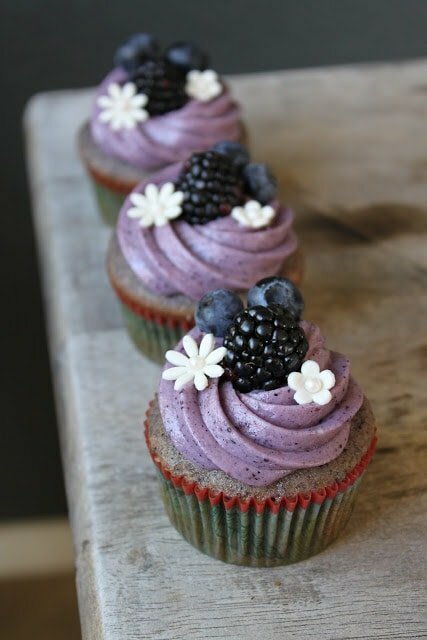 These cupcakes of yours look truly amazing, the color purple hue of the frosting, blends so nicely with the dark blueberries on top and to package it up you have selected the perfect little paper cup holders with that little red piping on the edge.. I LOVE cupcakes and cannot wait to make these, “with some help”..
May I ask you where you found your cupcake holders with the red trim? Thank you so much!! hi! can i use blueberry in can instead of dried blueberries? and the measurements will be the same? This recipe uses “freeze dried blueberries” not dried blueberries. 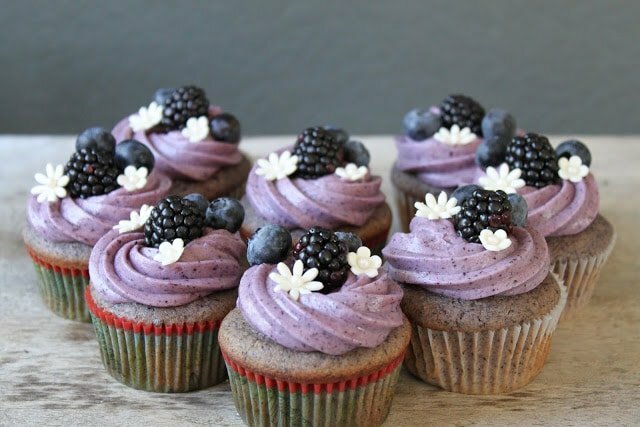 The freeze dried blueberries add natural color to the cupcakes. If you cannot find it, simply omit it. However, the resulting cupcakes and frosting will not have the same color as the photos here. Thank you for trying out the recipe! I’m glad you enjoyed it. I hope your niece had a wonderful birthday!